Cook your pasta according to the directions on the package in a large pot. Add the veggies to the boiling water allowing them enough time to finish cooking with your pasta. While pasta/veggies are cooking, heat milk and cream cheese in a small pan. Add in the shredded cheese (except 1/2 cup), Parmesan, garlic, basil and salt. Mix well. Drain pasta and return to large pot. Mix in the cheese sauce. Add salt to taste. 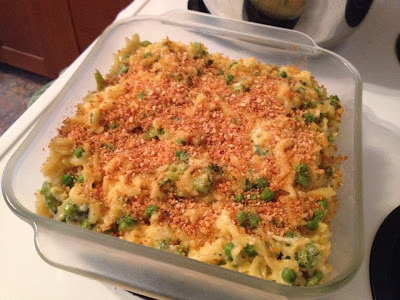 Pour in casserole dish, top with remaining cheese and sprinkle with bread crumbs. Bake at 350* for 20 minutes.